Creates a new empty string list model. Creates a new string list model. Create a new abstract list model. 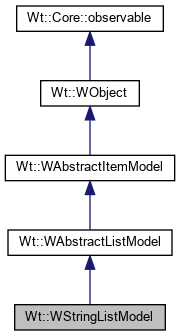 An model that manages a list of strings. This model only manages a unidimensional list of items and is optimized for usage by view widgets such as combo-boxes. It supports all features of a typical item model, including data for multiple roles, editing and addition and removal of data rows. You can populate the model by passing a list of strings to its consructor, or by using the setStringList() method. You can set or retrieve data using the setData() and data() methods, and add or remove data using the insertRows() and removeRows() methods. This method is reimplemented to return flags set in setFlags(). Sets model flags for an item. The default item flags are ItemFlag::Selectable | ItemFlag::Editable. Sets a new string list. Replaces the current string list with a new list.